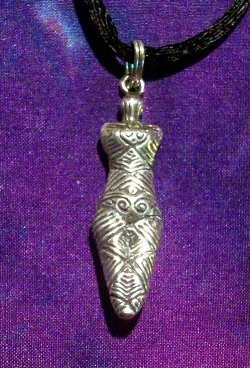 Sterling silver pendants based on ancient goddess artifacts. A black satin cord is included with each pendant. Or request it as an earring with sterling silver earwire. Each earring costs the same as one pendant. 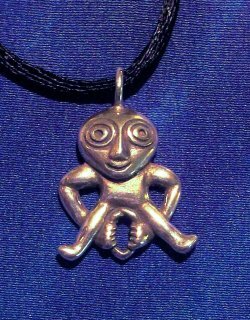 Design based on a clay goddess found in Northeast Romania from the Cucuteni Culture, 4300 BC. The lines swirl around her entire body, suggesting vibrant energy flow. Based on a 5+1/2 inch figure carved of mammoth ivory, dated 21,000-24,000 BC, found in France. Her arms rest on egg-like breasts. She inspires creative fertility. Sheela-na-gig is found atop many ancient doorways of churches in Ireland and England. This particular image is based on a stone corbel at Church of St. Mary & St. David in Herefordshire, England, built in 1100 AD. Sheela-na-gig blesses entryways and life's passages. She is often depicted as an old woman grinning while opening her sacred yoni. Note: If heavy earrings bother you, don't get this one.